If you were raised like I was, you probably already know that everything is better with bacon and conversely bacon makes everything better. Much to my chagrin, I have recently realized that that is not always true...I can say that I am not a fan of bacon in my chocolate----or maybe I just haven’t been given the right bacon to chocolate ratio. Aside from that, this recipe is AWESOME all because of the bacon. The second part of this recipe that makes it amazing is that I get to GRILL!!! Grilling may take a little perfecting when you first start, but once the basics are down, there is no stopping what you can create. And I know many who agree with me that a juicy, char grilled steak and grilled veggies will turn an ordinary dinner into something to remember. A few years back, a Weber Grilling Cookbook taught me to expand my grilling expertise and I have to say that this cookbook does not have a bad recipe. Although, some of the recipes may seem fancy, they are simple and as long as you follow the directions, every meal turns out fit for a king. This recipe is perfect for impressing guests at a dinner party, but make sure that you have enough because this entree does not last long on the table. 1 boneless, skinless turkey breast, about 2 lbs, butterflied. Note: I was unable to find a 2 lb turkey breast, instead used two 1 lb turkey breast. To make the stuffing, combine the bread crumbs, chicken broth, garlic, rosemary, oregano, lemon zest, salt and pepper in a bowl. The stuffing should be moist, but not runny. 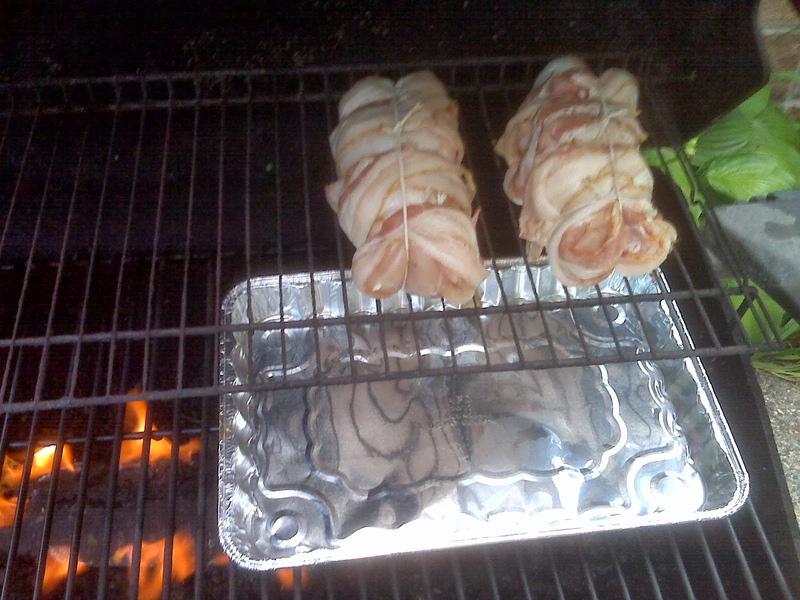 Prepare the grill for indirect cooking over high heat & place a disposable foil pan underneath the cooking grate to catch the bacon grease. Pound out the butterflied turkey breast between two sheets of plastic wrap to an even thickness. Spread the stuffing in the center of the breast and roll up the turkey around the stuffing. Arrange the bacon slices on a work surface in 6 lightly spaced parallel stripes, overlapping the ends of 2 slices to make each stripe. 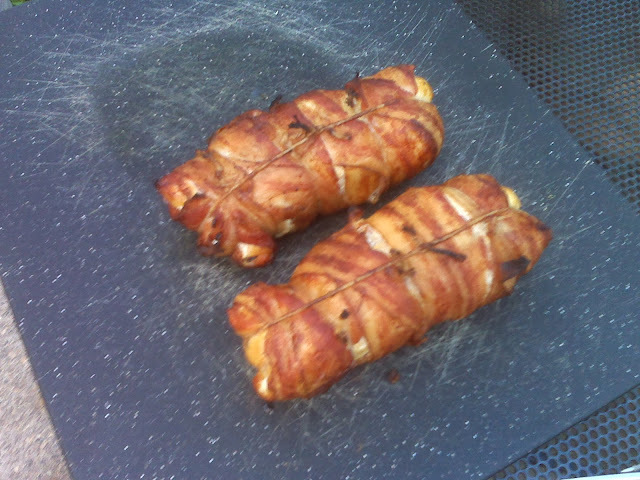 Place the rolled turkey breast in the center of the bacon and then crisscross the bacon around the turkey. 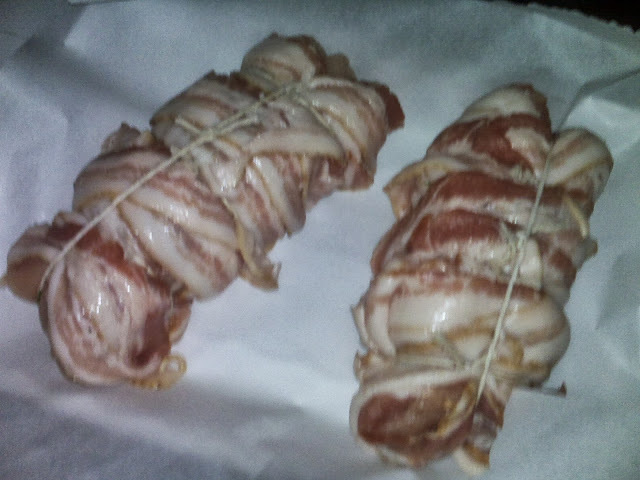 Tie the turkey with butcher's twine to create a uniform roast and to secure the bacon. Make sure the grates are clean, center the turkey over the drip pan and grill with lid closed for 1 to 1 1/4 hours until the internal temperature reaches 165 degrees F. Turn the turkey every 15 minutes to ensure bacon gets crispy on all sides. Remove turkey from grill and let rest for 10 minutes on carving board. Remove the twine and carve into 1 inch slices.